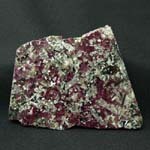 Eudialyte is presented plate tablet lamellar crystals, and also rounded grains and wrong massive accumulations. Colors rose, red of different tints, brown. Glance (glitter, glare) glassy. 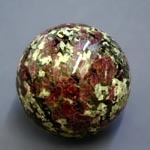 Eudialyte - most beautiful and rare mineral, using the deserved respect among the connoisseurs of jewels. 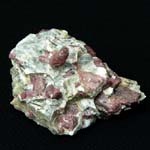 From the chemical point of view Eudialyte is a difficult silicate of zirconium, natrium sodium and calcium with including of different rare-earth elements. 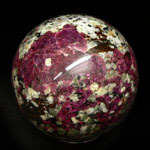 Eudialyte - rarest stone. Be found only in 3th places in the world. Chemical composition (chemistry, compound) - difficult and inconstant, in noticeable amounts there are a cerium, lanthanum, yttrium, iron, manganese. Ditrigonal'no-skalenoedricheskiy type of symmetry. Zhelatiniziruet under the action of muriatic acid, easily melt fuse in flame of candle, transformed in vitreous glassy opaque mass. Observed also as wrong grains and dense grainy the masses. 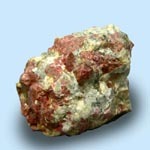 A mineral be found in nephelite syenite. 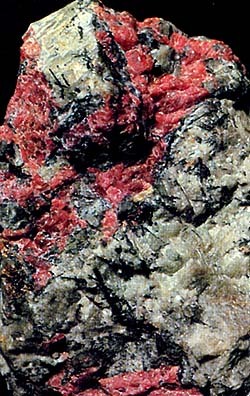 This silicate is met in Kangerdluarsuk in Greenland, in Magnet-kouv in the state Arkansas (USA) and in the rocks of Lovozero array in Russia (CIS). Application, use is on jeweller business. As insertions in jeweller decorations and material for the hand-made articles be found extremely rarely. Semilucent and translucent crystals and arrays of crystals of Eudialyte - the rarest and dear jeweller stone.